4 Bedrooms, 3 Full Baths, Sleeps 8, Southern Pool And Spa, Privacy Fence, Clean! This house is under new ownership, so we don’t have many reviews yet, but see the previous listing (VRBO number 1136853) to see the reviews on this house before we took over and see the reviews on our other houses listed below. We are a VRBO Premier Partner and have near perfect reviews on all our other houses. We are currently in the process of redecorating this entire house with a Star Wars theme! While we are redecorating (all redecorating happens in between guests) and building up reviews, we are offering special rates which won’t last long! Be one of the first to take advantage of this bargain! Need more than one house close together? We own the 4-bedroom house to the left of this one (VRBO number 838300) and the 5-bedroom house on the other side of that one (VRBO number 1164067) so we have 3 houses in a row! We also own a 7-bedroom house (VRBO number 955702) in the nearby gated community of Emerald Island and another 4-bedroom house (VRBO number 1277002) four doors away from the 7-bedroom on the same side of the same street. Jabba the House is the new name for this house which we are in the process of redecorating with a Star Wars theme throughout the entire house! 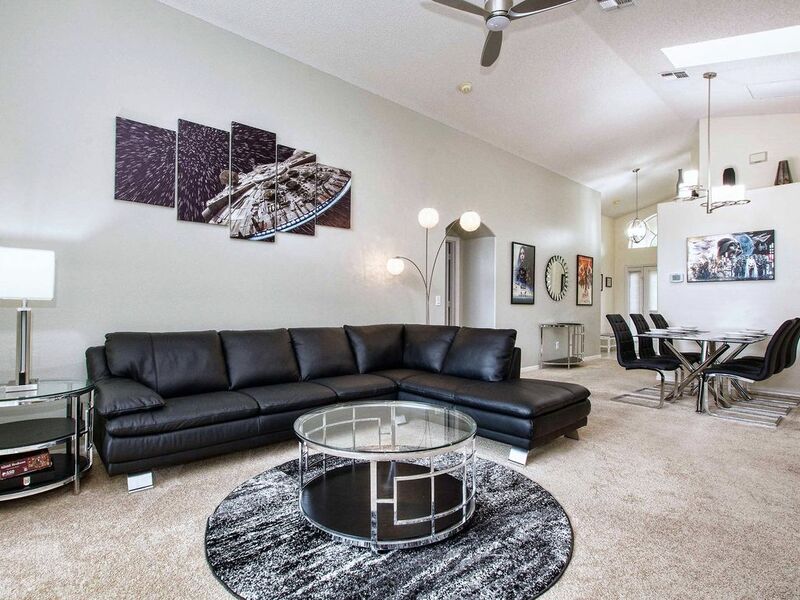 Jabba the House is a beautiful vacation rental home 5 minutes from Walt Disney World in Kissimmee, Florida. It has 4 bedrooms and 3 full bathrooms, including 2 master suites. This spacious villa sleeps 8 people in total comfort. The great room boasts a large, combined living and dining area which is open to the nearby kitchen and breakfast nook. The southern facing swimming pool with attached spa sits on a private pool deck surrounded by a screen enclosure and a privacy fence. No vacation home is complete without a game room and this one is no exception, featuring a pool table and foosball table. Let’s explore all the amenities in more detail! In addition to a great location, Indian Creek contains 2 playgrounds, a basketball court, a tennis court, a putting green and a jogging trail. All are free for residents to use. After location, one of the most commonly prized amenities is the pool, and Jabba the House has a great one! This spacious pool deck offers plenty of room to relax around this large southern facing pool with attached hot tub. No walking out of the house and falling into the pool here! A southern facing pool is desirable for the most sunshine on the pool throughout the day, but if it gets too hot, sip on a drink at the table and chairs located in the covered lanai. If it’s cooler, enjoy a soak in the hot tub. This unique, level-bottom hot tub makes a nice kiddie pool when the jets are off. Of the 3 exits from the house into the lanai, one is from the master bathroom, so no need to walk through the house with wet feet when nature calls. The screen enclosure covering the pool deck keeps out the bugs and lizards, while the privacy fence keeps out the prying eyes of neighbors. If you have little ones, the pool alarms on all doors and the removable toddler fence provide a safer and more relaxing experience for all. If you are visiting in the cooler months or just want to make use of the hot tub, pool and spa heat is available for an additional charge of $25 per night. The inside of Jabba the House is even more spectacular than the outside! Upon entering the villa, you pass through a small hallway lined with Star Wars pictures and posters before emerging into the open and bright great room. The skylights in the great room and kitchen make it hard to tell if lights are on or off during the day. The formal dining table has seating for six persons while the breakfast nook off the kitchen has seating for another four persons. There are also an additional two bar stools for seating at the kitchen counter. The family room has a brand new, L-shaped, black leather couch accompanied by a futuristic lamp to accent the new look. A new chrome and glass dining room table, breakfast nook table and accent tables along with chrome and black leather chairs are on their way and should be in place by late September of 2018. The 50-inch flat-screen TV has been wall-mounted over a new floating, black entertainment shelf and yes, you may play with the Star Wars figures on the shelves above the TV! The entertainment shelf houses a new Xbox One gaming system along with some games and movies for your enjoyment. Of course all the TV’s in the house have free cable TV. The bright kitchen has a side-by-side refrigerator with filtered water and ice, a dishwasher, range and microwave. The kitchen is of course fully equipped with everything you need to prepare gourmet meals or easy lunches to take with you. There is also plenty of plastic-ware for use by the pool. The 14-cup coffer maker is accompanied by a stocked, coffee caddy, so if you arrive late at night, your first pot the next morning is on us! Off the right side the main living area of Jabba the house is the master suite. The master suite features a king-sized bed with a brand-new mattress, walk-in closet, and a 40-inch, wall-mounted, flat-screen TV. The master bath is a full bath with two sinks, a huge garden tub and a huge shower. The is also a door to the pool deck from the master bath, so you don’t have to walk through the house with wet feet coming from the pool when nature calls! Off the left side of the great room is the queen bedroom. The queen bedroom has a queen-sized bed, closet and wall-mounted, 32-inch, flat-screen TV. The full bathroom just outside the queen bedroom can be shared or used just for the queen room making it just as good as a suite. Off the right side of the main entry hall are the two twin bedrooms and shared bath. The first twin bedroom has been completely remodeled with Star Wars bedding and matching decor. The shared, full bathroom has also been remodeled with Star Wars decor. The second twin bedroom has a lovely animal theme now but will soon also be remodeled as a Star Wars bedroom as well. Opposite the twin bedrooms off the main hallway is the game room. Jabba the House has a newly remodeled game room decorated with…you guessed it Star Wars decor! The game room features a pool table and Foosball table surrounded by all the Star Wars movie posters! In addition to all the fun stuff, Jabba the House is equipped with all the necessities you may need for your family vacation. There are a washer and a dryer located off the main entry hall stocked with over-sized pool towels and complimentary laundry detergent. The house is stocked with at least one roll of paper towels and one roll of toilet paper in each bathroom as well as a small soap in each bathroom. We provide kitchen garbage bags, dishwasher tablets, laundry soap and coffee filters. For those with younger family members, there is a pack-n-play. We love to host families, so if there is something missing, just ask us, and we will consider purchasing it for the house! The final amenity of this house to consider is the dedicated new ownership. We acquired this house in July of 2018. We were lucky to get it! The previous owner was great, and the house is kept beautifully. This is the fifth house we have purchased in the area and we have near perfect reviews on all of our houses. Our business philosophy is simple: provide an impeccably clean house, constantly be upgrading the house and provide the best customer service possible! Below is a list of some of the upgrades we have done since taking over. Try Jabba the House for your next vacation! My wife and I live in Pittsburgh, Pennsylvania. We have two wonderful boys (currently age 9 and 12). We love to travel and have been all over the United States and a good bit of Europe with our two boys. They are veteran travelers! I have had the opportunity to travel around the US for business and have frequently taken my family. My mother is from the lovely country of Luxembourg, and still has close relatives there, so we have had the opportunity to explore many of the neighboring areas throughout Belgium, France and Germany. I can speak a little bit of French and a tiny bit of German. My brother spent about 8 years in England and I was fortunate enough to have had the opportunity to visit him in this most beautiful of countries on several occasions. Our family would rarely travel to the same destination repeatedly with the exception of Orlando (there is just so much to do!). A few years ago we traveled to Disney World with our family and 3 grand-parents (7 of us total). My wife had the brilliant idea to rent a vacation home and we all enjoyed it so much, we decided to look into purchasing our own. We did so well with our first vacation property and had so much fun, that we decided to try a second one and see if we could duplicate our success. Things went so well with the second property that we have decided to sell all our long-term rentals in Pittsburgh and buy more vacation properties in Florida and this is our main business now. Our family usually enjoys one or two trips to our beautiful homes in Orlando each year, and the rest of the year we rent it out for others to enjoy. Do you love Star Wars? We do! We decided to dedicate this whole house to the Star Wars universe. Complimentary garbage bags, dishwasher tablets and laundry detergent. We had a fantastic time staying at this villa. Gerry’s communication and helpfulness throughout the booking process and during our stay was excellent and made us feel reassured. The villa is very well located just a few minutes drive from the main run of restaurants and shops on the 192 and about 10-15 mins drive from the Disney Parks depending on traffic. He has done a great job of refurbing the place and my boys loved the Star Wars theme. Great quality pillows, sheets and duvets and a quality mattress made the real difference to me. so many vacation owners under estimate the importance of a quality sleep after a long day at the park and skimp in this area. You won’t be disappointed in these beds. Furniture inside is new and modern and felt very clean - we spent hours trawling through many listings to find one that didn’t feel like a terrible compromise on what we are used to at home. Great washer & dryer means I go home with clean clothes. Kitchen is clean & has everything we needed when we did cooking at the house.. Pool and hot tub was just what we needed after a day at the parks and the games room was a nice feature. Overall the villa was fantastic for our needs. Celebration is close by and worth a drive to for dinner. We ate at D’Antonios which was a great Italian on the lake front. The patisserie sells delicious macaroons and we bought some cute gifts from the dog store. Sit on the rockers by the lake & watch the sun go down. We also are at Outback Steakhouse twice - good steak not so expensive. The ihop on the way to the park was cheap and tasty. We had takeout pizza from flippers which was good value & nice. All in all a great holiday! The house was excellent , very spacious for me, and my family. This was in the ideal place to go to Disney or any where in Central Florida. When you go to Disney you are about 3 min away. The owner was helpful and he did check with us to make sure we were happy with the . accommodations. I would rent it again but , there are no openings for two months again. My family and myself really enjoyed the house, pool and hot tub. Thanks Bob! Glad to hear you enjoyed your stay! This is now our best booking house, so unfortunately you have to book it pretty far in advance! Thank you Laura for the kind words! We are very happy that you enjoyed your stay. We would love to have you come back again! We stayed at the house during a short stay to visit Disney and Universal Studios. The location was great and the house was fabulous. Plenty of room and space for all 8 of us. The kids loved the Star Wars decorations and spent almost all of their time in the heated pool. It was great to have floaties and other pool toys available. The house was well stocked with dishes and pots and pans. Gerry was very attentive when we had questions or issues during our stay. We highly recommend! Thanks Ann! Happy to hear that you had a good time! Please keep us in mind for future vacations to the area! I have stayed in villas in Indian Creek (its so convenient for shops, restaurants and Disney) for about thirty years now, and this was the best experience. The villa is immaculately clean, the pool is gleaming, and it is extremely well appointed with wonderfully comfortable beds. This is a villa that will also make you smile, if you are a star wars fan then the decor will interest and amuse. The detailing is fabulous. You open a drawer and there are star wars themed oven gloves. Just a little detail - but there are so many to make you smile. But there is a lot here for non star wars fans too. The light fittings are of a superb quality, the bed linens pure cotton - no cheap poly cotton here. Top of the range washer and dryer in a shiny red even made doing laundry great. This was the most enjoyable two weeks in a villa in Indian Creek - probably because the bed was so comfortable and the pool so clean. A couple of light bulbs needed changing when we arrived and the villa management team were superb and sorted it out immediately. The most responsive team I've ever seen with a management company. I cannot recommend this villa too highly - and its the first time in thirty years I have been able to fully recommend a villa without reservations. Oh and by the way in case you think my explosion of joy over this villa is too much I should point out I don't know the owner at all, and my only connection was with this booking but he is so keen that the experience be a good one. Don't forget to read his restaurant reviews - they were brilliant for those wanting to eat at independent local restaurants rather than the usual chains. New places are opening up all the time as newer developments are being built, but here at Indian Creek you are away from the noise and dust.. So if you can get availability, go, and have a great holiday! Thanks for the great review! We have six houses in the area, but this is the one I have the most with on the decorating! Keep in mind that it is only about 50% to 75% done with it's Star Wars "makeover", so much more detail is added all the time (in my owner's closet, I have a Star Wars "Last Supper" painting, which I will hang next time I am there!). I am so happy you noticed extra effort put into the details! I only buy all cotton sheets for all of my villas. I also replace all the pillows at least once per year, and all the king and queen beds should have 4 pillows (though the cleaners do not always put all four out, the extra's are there). The king mattress is brand new and the queen will be replace in the next month as well. The bulbs in the lamp just went out during the last guest's stay, so I apologize they needed to be changed. The cleaners are supposed to tell the manager when bulbs are out, but it does not always happen! FYI, I have added 5 new local restaurants to my list, and one of them is my new all-time favorate in the area! We hope you come back again and try one of other houses, and some more restaurants! Thanks again!!! Jabba the House had everything we needed. Spacious and clean, and in a great location. The owner and manager were very quick to respond to emails and phone calls and took care of all our needs. The pool and deck is a decent size and received sun all day. There's an umbrella provided for shade too, which is great and there's plenty of patio furniture. The rear yard is fenced for privacy and baby items are provided. We would recommend this property to anyone looking for a Kissimmee rental! Thanks for the nice review Stephanie! We are glad to hear that you enjoyed your stay. We hope you come back again and try one of our 6 houses for your next trip!